A circular route round the Vale taking another chance to scale Dragon Hill and take in the view before the end of summer. Out through Challow, Sparsholt and Uffington before duelling with the Dragon. Back down, through Woolstone and Balking, Goosey and home. PLEASE NOTE: In the event of heavy rain we will bypass under White Horse Hill due to the danger of descending in poor conditions. Fellow leaders please download the route if you can, in case we have high numbers. 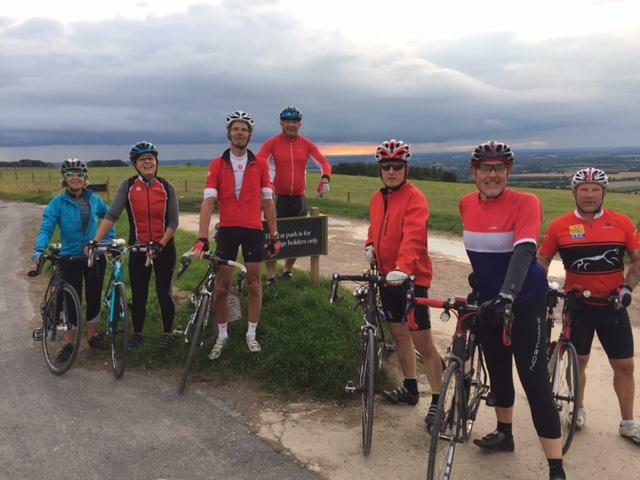 Eight riders braved the threat of rain and Dragon Hill on what turned out to be a fairly pleasant evening. We took a less than usual route out to the spring line road keeping a steady pace as we knew what was ahead. Taking the full stretch of the climb from Uffington up to the White Horse we all crested the top in time to see the setting sun and a good backdrop to the view.